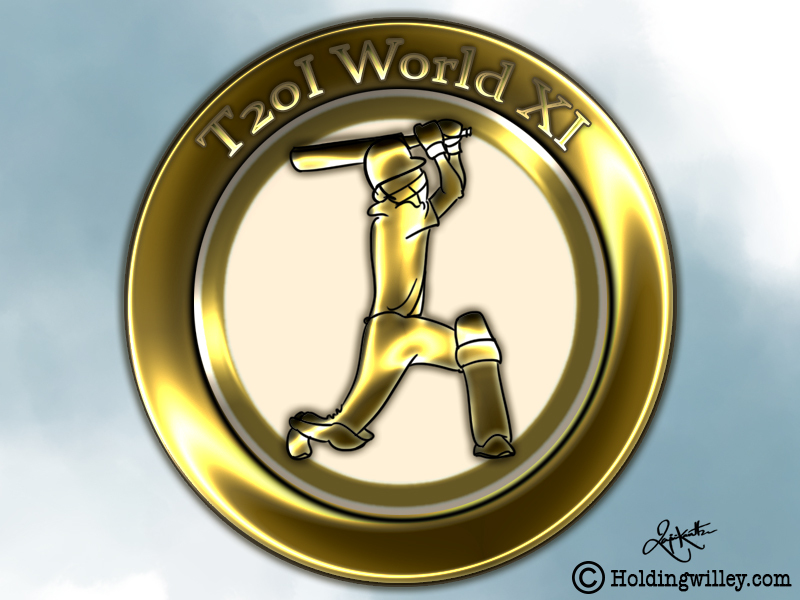 The first T20I was played between New Zealand and Australia on 17th February 2005. Since then there have been over a thousand players who have represented their countries in this format. While a few have been unable to adapt to the unique demands of T20Is, others have established themselves as genuine greats of the game due to their stupendous performances. In this article, I will select an all-time World XI based on their international exploits. It is an exercise fraught with danger as some disgruntled fans will no doubt be dangerously disappointed if their heroes miss out. Such an exercise would be incomplete and futile without statistics. Only the career stats of players in T20Is have been analyzed, not their performances in franchise cricket. All stats are updated till the end of the T20I between India and Bangladesh on the 8th of March. Here is the XI in batting order. Guptill is the highest scorer in T20Is, with 2,271 runs to his name from 75 matches at a strike rate of 132.88. He is one of just 7 players to score at least 2 centuries in T20Is. Guptill’s strength is an incredible eye. He picks up the length much sooner than mere mortals. He hardly takes any time to settle in and can play his shots pretty much from the word go. He may have been overshadowed by his teammate Colin Munro in recent times, but there is no doubting Guptill’s pedigree as a great opening batsman. He narrowly pips players like David Warner, Rohit Sharma and Shane Watson for the opening slot. While many positions in the batting order can be debated, Gayle is without doubt the greatest batsman ever to play T20s. Gayle is probably the hardest hitter of the ball in world cricket and has sent the ball soaring into the stands on many occasions. His form may have petered out a bit recently but his record is still impressive. He packs such power in his shots that even his mishits clear the boundary on occasion. Gayle can take a bit of time to settle in before going berserk, but when he does get going it is spectacular. He has scored 1,589 runs from 55 T20Is at an average of 33.8 and a strike rate of 145.11. He can also chip in with a couple of overs of off-spin. His international retirement just prior to the WT20 in 2016 came as a surprise to many as he was still performing at the highest level. With Mahendra Singh Dhoni having an underwhelming record in T20Is, Baz was the ideal choice for the wicketkeeper’s slot. He will also skipper the side and his refreshingly positive captaincy is a breath of fresh air. He was the first batsman to score 2,000 runs in T20Is and will have no trouble adjusting to the number 3 slot. He makes full use of the fielding restrictions in the first 6 overs and goes after the bowling irrespective of the situation and caliber of the bowlers. He has scored 2,140 runs from 71 matches at an average of 35.66 and a strike rate of 136.21, and has 32 dismissals as a keeper which include 24 catches and 8 stumpings. Kohli normally bats at number 3, but given the wealth of talent in this world XI, he will slot in at number 4. He may not be a muscular hitter like Chris Gayle, but he still scores a lot of runs at a rapid rate with clean hitting and an orthodox technique. He is peerless in finding the gaps in the field and is testament to the fact that it is possible to score heavily even in T20Is by keeping the ball on the ground and rotating the strike. He has scored 1,983 runs from 57 T20Is at an average of 50.84 and a strike rate of 137.32. Maxwell is a big hitter who is so unorthodox that bowlers are often clueless as to what and where to bowl at him. He does not play the bowling on merit but seems to manufacture shots at will, depending on where the gaps in the field are. He has a penchant for playing audacious low percentage shots but they seem to come off on most occasions. He is a three-dimensional cricketer as he is a brilliant fielder and can also bowl off-spin. Maxwell has scored 1,072 runs from 43 T20Is at an average of 34.58 and a strike rate of 165.68. His strike rate is the highest among all 40 batsmen who have scored at least 1,000 T20I runs. This might seem like a bizarre selection given the number of great players to have graced this game, but Miller has the numbers to back it up. He does not get the credit for his achievements as he is overshadowed by the presence of players like AB de Villiers in his team. The fact that he is a left-hander and is capable of launching big hits right from the start is a feather in his cap. He is also a brilliant fielder. He has scored 1,070 runs from 60 T20Is at an average of 28.91 and a strike rate of 139.86. Dwayne Bravo is one of the first names that comes to mind when you think of the top all-rounders in T20Is. His stats show that he is worth his weight in gold. He is one of just 5 all-rounders to score 500 runs and also pick 50 wickets in T20Is. He has played 66 T20Is and has scored 1,142 runs at 24.29 and a strike rate of 116.41. He has a Caribbean flair and panache in his batting and is capable of depositing huge sixes into the stands. With the ball he has taken 52 wickets at 28.26 and an economy rate of 8.46. He has a very well disguised slower ball and usually bowls at the death where he uses his clever variations in length and pace to deceive the batsmen. Shakib Al Hasan is without a doubt the greatest cricketer produced by Bangladesh and he never gets his due for his performances or the limelight. His batting has not fulfilled his enormous potential, as he has scored 1,223 runs from 61 T20Is at a batting average of just 23.07 and a batting strike rate of 121.2. However, he is brilliant with his left-arm orthodox spin, and has taken 73 wickets from 61 matches at an average of 20.67 and an economy rate of 6.8, which is excellent in T20Is. He also provides some depth with his batting at number 8. Badree is one of the top leg-spinners in the world. His economy rate of 5.98 means that he concedes runs at less than a run a ball, which is incredible in T20Is. There have been 21 spinners who have taken at least 30 wickets in T20Is and Badree has the 3rd best economy rate amongst them. Malinga is one of the all-time great pace bowlers in T20Is. Past his best now, at his peak he was the master of an assortment of variations that included the slower ball and the yorkers he used to bowl almost at will. He has played in 68 matches and has taken 90 wickets at an average of 19.77, an economy rate of 7.36 and a strike rate of 16.1. His economy is misleading; it might seem that he is a touch expensive. However, he usually bowls in the Powerplay and at the death. He is sometimes called upon to bowl in the middle if the opposition batsmen are running riot and Sri Lanka desperately need a breakthrough. Many critics consider him the greatest T20 bowler of all time. Bumrah made his debut for India just 2 years ago but has already made an impact for India in all 3 formats. A protégé of Malinga at Mumbai Indians, he has made rapid strides under Malinga’s tutelage. He has an action that is difficult to pick and bowls a lot of well disguised slower balls and yorkers. He is one of the top bowlers in the world in the death overs and rarely gets hit. He has played in 34 T20Is and taken 41 wickets at an average of 20.43 and an economy rate of 6.85. He holds the record of most wickets taken in a calendar year in T20Is, when he took 28 wickets in 2016. What was incredible was that he achieved this feat in his very first year in international cricket. He bowls with the maturity and composure of a veteran and not someone who has competed for just 2 years at the international level. This all-time XI is full of players with great records and ability. In the event of being called upon to play a match against a Martian XI, they will acquit themselves with flying colours.